Kammic debtors are not spirits or ghosts. They are the result of bad deeds we have done that turn back and bear its result. This is different with spirits. It is important to transfer merits when we reach a T junction or a cross road. Reason being, there may be those who have previously had died from accidents there- became spirits dwelling in that area. Sometimes, when people driving in the car are quarrelling (where mindfulness lapses), the spirits could bring about accidents to happen out of mischief. When we transfer merits constantly, these spirits get scared and run off- much like what bandits would do when they see the police coming. The bandit knew he had done something bad and hence was afraid of the police. During her visit to Malaysia and Singapore, Khun Mae had to teach many people to transfer merits to ancestors, kammic debtors, maras, spirits, hungry ghost, etc as many who have performed dana (donations/ offerings) with faith often overlook to transfer merits. Or they may choose to transfer merits to themselves or perform dana out of the wish for something for themselves but had forgotten about beings (especially the unseen) living amongst them. The Buddha had always taught us to transfer merits as often as we could. Many of you would have heard about the story behind Karaniya Metta Sutta- about 500 monks who went to stay in the forest and were initially frightened by ghosts. The Buddha taught them the Karaniya Metta Sutta – the monks went back and radiated loving kindness towards the spirits. Instead of scaring the monks, the spirits in turn protected the monks. 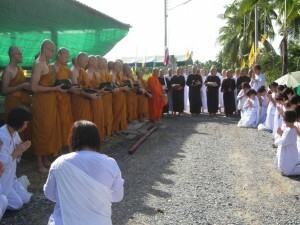 The 500 monks spent the vassa (3 months rains retreat) practicing in the forest and attained Arahantship.